We have been having several events at LEA19-The Portuguese Way since its opening in September. This Saturday, September 26 at 3PM PDT we are having a coral cyber dance performance in which everyone attending will take part. All the guests will be provided for the event with a kit of some customizable outfits. Those are dance skins textured with paintings of Janjii’s “Just feelings” RL series. These outfits were conceived not only to reduce lag but also to embed the participants in the whole environment. In case you wish to have the outfits before the performance, please send me an im inworld and I will send them to you. In this performance we propose a meeting of avatars for a celebration dance: Portugal and Brazil united to celebrate the rediscovery in an exercise of mixed cultures arising a feeling of belonging through dance, music, language and culture. Of course this is not just for Portuguese speakers, since dance and music are international languages. The scenery created by Wan Laryukov and Janjii Rugani is embedded in the water which represents that feeling and, at the same time, the Atlantic Ocean which has separated for centuries those two people who admire each other from overseas and that in the virtual reality are joined together in the same sea populated by Wan’s sculptures. These sculptures evoke the avatars’ cyber bodies representing the post human being that we are. 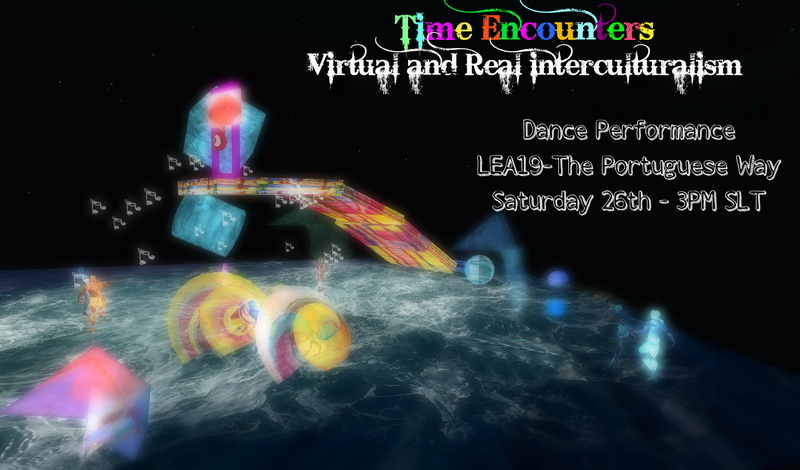 Thus the feelings and mixed cultures are the theme of this coral cyber dance that, inspired in the work of Rudolf Laban, becomes an interactive cyber performance where everyone is invited to participate, being free to choose from the different options and animations available. Each one can choose to join the HUD of the choreographer Janjii Rugani or the several dance machines scattered through the platform, or even bring their own HUDs since the idea is not to have homogeneous movements but yet their diversity which unites us. Rudolf Von Laban (1879-1958) was a dancer and choreographer and is considered as one of the most important dance theoreticians of the 20th century. He dedicated his life to the study of the systematization of the movement language in its several facets: creation, notation, appreciation and education. Laban dedicated himself to dance proposals for the masses, developing the art of coral dance, where a large number of people move together in a simple choreography, allowing dancers and common people to dance together in a collaborative way. This part of his work is closely connected with his personal spiritual believes, based in the Victorian Theosophy, Sufism and Hermeticism, popular by the end of the 19th century. The expression coral-dance leads us to the early years of the 20th century, when Rudolph Laban, after joining the “Ordo Templi Orientis” in 1914, directed some coral dance rituals on Verita Mountain, Ascona, Switzerland in the year of 1917 at a workshop where his ideas became popular.